Network is a connected collection of device and end point systems, such as computer’s and Server’s which can communicate with each other. P C : The computer serve as a end point in the network that they send and received the Data. A. NIC: that Translate computer data into a format that can transmit over the network. B. Network Media: Such as cable or Wireless Media that provide the means by which the signal are transmitted from one network device to another. C. Connector:that provides the connection point for the media. Switches: Switches are the device that provides networks attachment to the end systems and intelligence switching of the data within the local network. 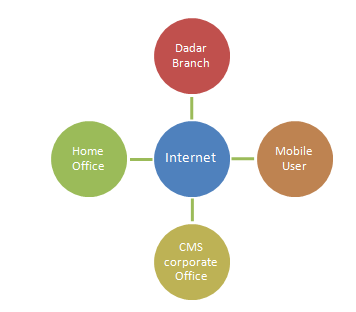 Routers:Routers interconnect networks and chose the best part between networks. WLAN: Wireless LAN device: WLAN device connect network device computers and other end pint to the network without cable. The minimum requirement for the wireless access to the network is an end point with WLAN, NIC and an access point that connect through the wire network. 1. Speed: Speed is a major of hoe fast data is transmitted over the network a more term precious data rate. 2. Cost: Cost indicates the general expanse of component, installation and maintenance of network. 3. Security: Security indicates how to protect the network is including information that is transmitted over the network. 4. Availability: is a major of Probability that the network will be available for use when it is required. 5. Scalability: Scalability indicates how well the network can accommodate more uses and data transmission requirement. 6. Reliability: Reliability indicates the dependability of the Components that make up the network, such as Routers, Switches and PC. Reliability is a often major as a probability of failure or means time between failure. 7. Topology: In Network there are physical and logical topology. A. Physical Topology: is the arrangement of the cable, network devices and end System. B. Logical Topology: is the part that data signal takes through physical topology. Protocol: Protocol is the set of rules which define communication over the network.